We are drowning in information, but starving for wisdom. This was the heading for an article I read this morning, and although its meaning and intention had nothing to do with the thoughts that flickered through my head (the merits of a liberal arts education) upon first seeing the quote, there is definitely an implication that resonates with me. This is all a little random, but I do feel as if more should be shared on this space than just the occasional recipe or review. Heck, it’s why I love the Internet. Variety underpins sensory awareness, exposure, curiosity. One reason why I love blogging about food is because I don’t see the stuff as merely something to eat, but as complex edible objects which hide more abstract, profound meanings, relevant to little aspects of our everyday lives. I remember to take things a little slowly when spreading soft, salted butter on my toast, the pale creaminess reassuring. A sticky, sweet medjool date makes me lose myself just for a second. Pause. Ponder. It sounds silly, I know. Is it just me? Information, and so much of it, is the nexus of the 21st century. But though it’s everywhere, in the form of the news or the hippest TV series or the next best recipe (oh, just you wait), wisdom is rare. It may be argued that the accumulation of knowledge naturally leads to this to this point of discernment and judgement. I like to think of it as a meal: the info is the appetiser, the formulation of opinion or analytical discussion comprise the main course. The dessert, further debate, perhaps division or (!) discovery. But the intriguing bit lies in the waiting time between appetiser and main course. Our information thresholds, where we draw the line between absorption of the world around us and internal debate. I like that thought; it’s interesting to consider just how different our thought processes are. As we prowl possibility, awaken a hidden psyche. That is what leads to understanding and progression. I’m guilty of being a robot sometimes, to squander away time doing meaningless activity, to have stuff go in one ear and come out the other. I mean hey, it’s ok to be a vegetable! It is, sometimes. I just think it more necessary in this current day and age to be that much more perceptive, instead of gulping air, nodding, regurgitating. I shall now introduce you to my new favourite pancake recipe: Eggless, flourless, practically everything-less (vegan readers, you there?) 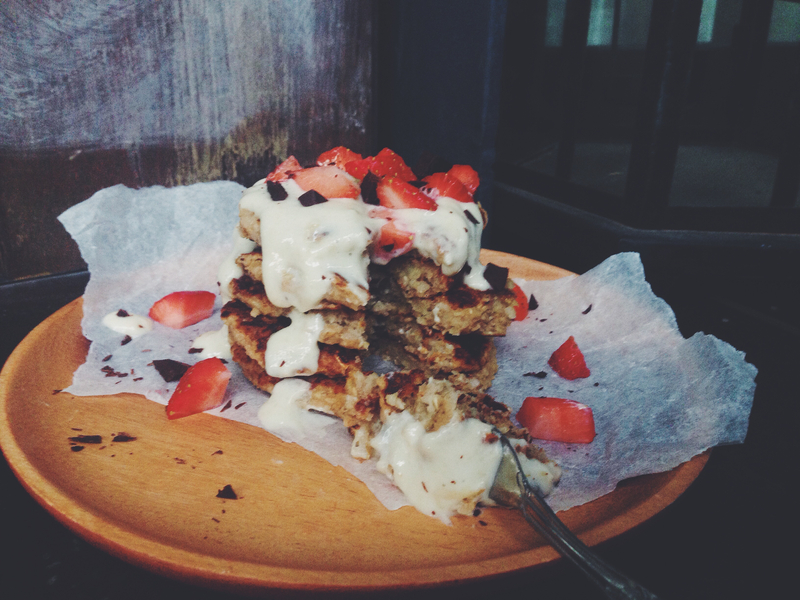 banana oat pancakes, with a decadent cashew sauce. I should like to clarify the name of the sauce here; I say cashew because I’m currently going through a serious, unrelenting vanilla cashew butter phase, and the cashew butter is the primary component of the sauce, but really you can use any nut butter you have lying around. It is the tang of this sauce, thanks to the yoghurt, coupled with the naturally sweet, earthy nature of these glorious pancakes, and milkier aftertaste of the cashews, which makes it the most divine breakfast for days on end. I like making normal pancakes, I do. You know, with actual flour, eggs, the whole motley crew. They’re easy easy easy, and the recipe is just standard stuff after a few goes. But these. These! 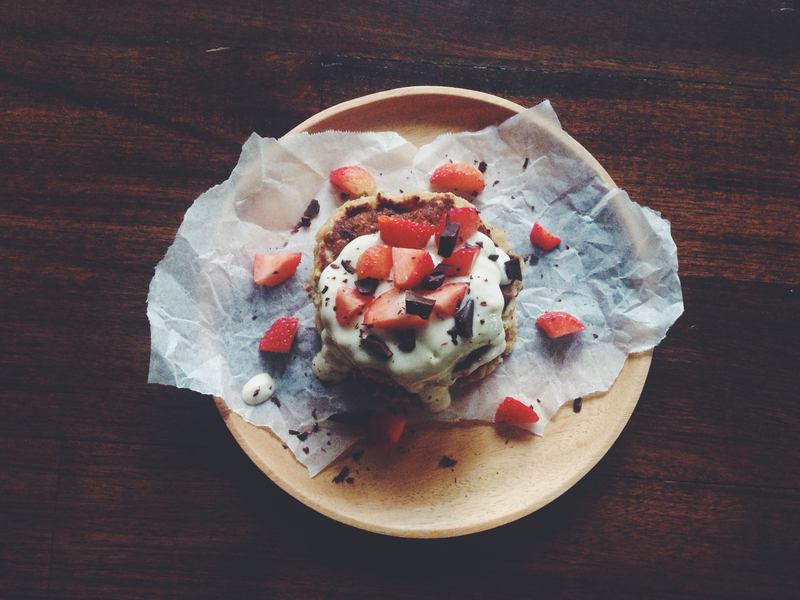 I couldn’t believe how sweet, fluffy and flavourful these pancakes turned out to be! When I first starting experimenting with healthy, or at least healthier ingredients, I was incredibly skeptical of the turnout. They would never taste or look as good, I bet on my life, I always thought. I associated things like wheatgrass and acai and oat flour with the life of a poor rabbit. How wrong I was. How terribly wrong. The ripe banana here makes these naturally, not overly sweet, and if you are inclined to leave a few chunks in the batter then you get nice pockets of cooked, sweet banana in your breakfast. The oat flour makes it all folksy, almost cultured, and using it for the first time in pancakes brought to mind thatched countryside roofs and battered wheat and yoga. It brought me down to earth, and it always feels good to treat my body well, to give the french toast and white/fancy breads a break. Preheat a pan on medium heat. In a medium bowl, whisk together the oat flour, salt and baking powder. In another medium bowl, mash the bananas, then mix in the remaining wet ingredients. Pour the dry ingredients into the wet mix, and use a large spoon or spatula to slowly incorporate everything until just combined. Drizzle a little coconut or vegetable oil to the preheated pan, and, using a tablespoon, ladle on enough batter to make a circle around 4 inches wide. This part is completely up to you; make them as big or as small as you want. Cook the first side for around 2 minutes/ You’ll notice the edges firming up and turning a slightly darker colour than the middle, and that’s when you should take a spatula and slide it under the whole pancake in preparation to flip. If it shakes or wobbles too much on top, let it cook for a while longer. After flipping, cook the second side for around 30 seconds, for the pancake itself is already mostly cooked by this point. Let the cooked pancakes rest on a paper towel while you finish up the rest of the batter, or in an oven preheated to 160C if you wish to consume everything immediately. Make the sauce! In a small bowl, mix the 3 ingredients listed above. The consistency should be on the thicker side, but not gloopy and unmanageable. 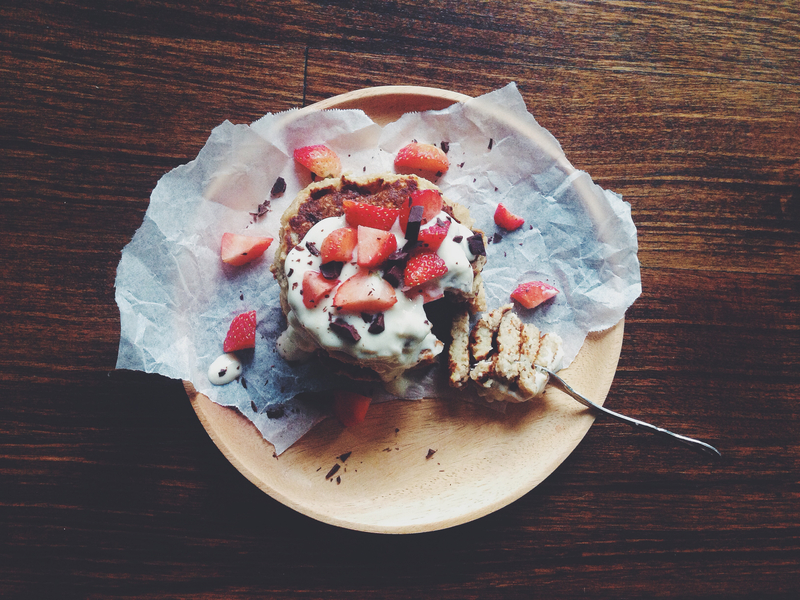 To serve, stack a few pancakes on top of each other, top with the nut butter sauce and fresh fruit. The pancakes are naturally very sweet so I don’t think maple syrup or honey necessary, but go ahead if you feel like it. Pancake eaters do what instinct tells em to. These pancakes freeze very well. After cooking and letting rest on a paper towel for around 5 minutes, transfer those which you’re not eating immediately into a ziploc bag, laying them in a single flat layer. Pop in the freezer, and whenever you’re in the pancake mood, take however many you want out and microwave on high for 2 minutes.